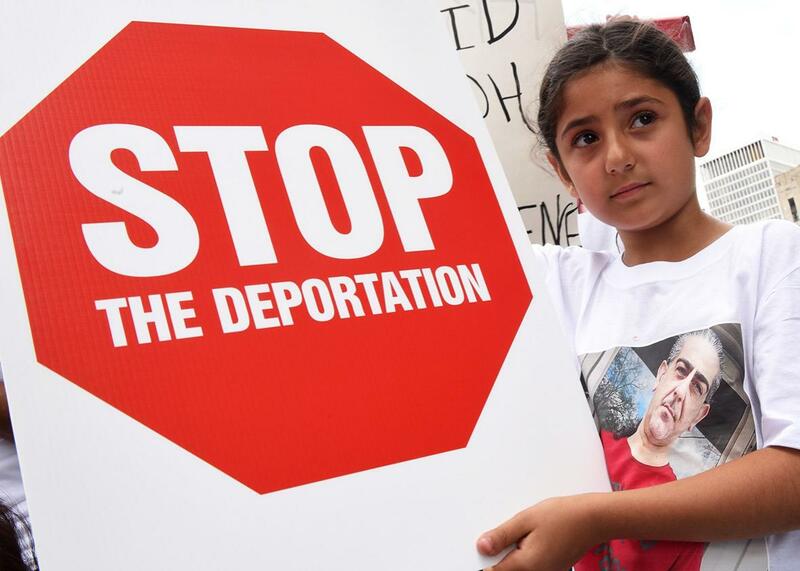 Michigan’s Iraqi Chaldean community is fighting to protect dozens of people from deportation. Michigan’s Chaldean Christians escaped persecution in Iraq and helped Donald Trump win the presidency. Now, they’re at risk of deportation. 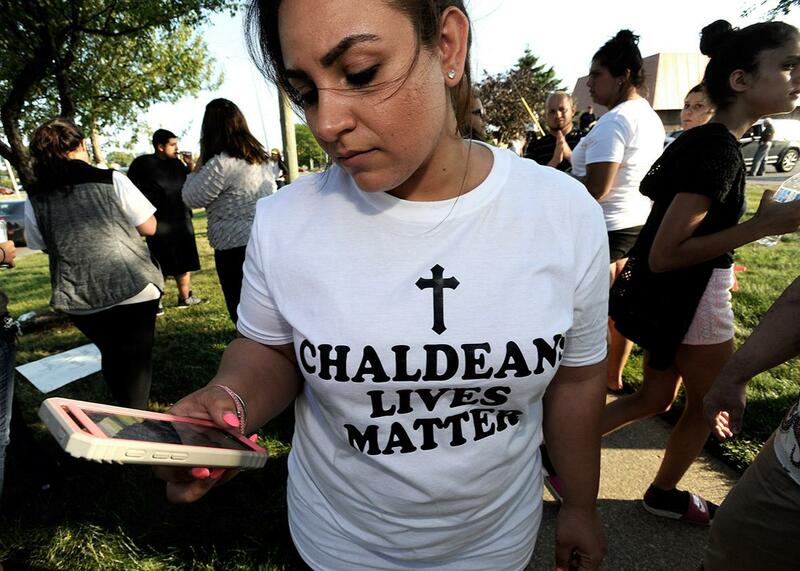 Astevana Shaya, 28, wears a Chaldeans Lives Matter T-shirt at a protest on June 12 in Sterling Heights, Michigan. On the afternoon of Sunday, June 11, a 29-year-old finance lawyer named Wisam Naoum stopped at a gas station to stock up on beer. It was a sunny, hot afternoon, approaching 90 degrees, and Naoum had a leisurely day planned at his sister’s backyard pool. Earlier that morning he had heard rumblings of trouble in his community, but nothing was confirmed, and Naoum was wary of unverified rumors, so he kept his plans with his sister and her family. Naoum is a well-known figure in his religious community: metro Detroit’s Chaldeans, a sect of Christianity affiliated with the Catholic Church and particular to ethnic Assyrians from Iraq. And the troubling rumors he had been hearing were of Immigration and Customs Enforcement agents rounding up Iraqi-born Chaldeans for deportation. Estimated at 121,000-strong, Michigan’s Chaldean community is the largest in the world outside of Iraq, from where these Aramaic-speaking Mesopotamians claim their ancient roots. It’s a result of multiple waves of immigration, mostly starting in the late 1970s and early 1980s, when many came to the United States as refugees fleeing anti-Assyrian killings and the chaos of the Iran–Iraq War. Since the 2003 U.S. invasion of Iraq, sectarian violence, civil war, and the rise of ISIS have killed or displaced more than two-thirds of Iraq’s Christians. The Chaldeans of Michigan have a conservative history, consistently supporting the Republican Party with votes and donations, and they voted heavily for Donald Trump in the 2016 election, helping him win Michigan by fewer than 11,000 votes. Trump and Vice President Mike Pence inspired many Chaldeans to show up at voting booths with unprecedented enthusiasm by promising to protect persecuted Christians in the Middle East. A Chaldean priest publicly blessed Trump while he was on the campaign trail, and conservative Christians praised Trump’s commitment to Christian minorities on Facebook. Few in the community expected that Trump’s immigration crackdown—touted in part as a means to protect the country from radical Islamists—would come to target them. But while at the gas station, Naoum received a call from a friend, a prominent Detroit-area attorney. ICE had detained some of his Chaldean clients. By the time Naoum got to his sister’s house and spent some time with her kids, he was getting messages from family and friends reporting dozens of detainments. At one point, he got a call from a friend from college: “They got my brother,” the friend said. So Naoum locked himself in his brother-in-law’s home office and started making calls. He called friends from law school who work at the International Refugee Assistance Project, a legal nonprofit that has been a leader in the fight against the Trump administration’s travel ban executive orders, who in turn contacted the National Immigration Law Center. Naoum also called other young Michigan Chaldean community leaders, including a lawyer named Nadine Yousif Kalasho. Kalasho was having dinner with her fiancé when she started hearing news of the raids. Together with her legal partner, the 27-year-old runs a clinic called Counseling, Opportunity, Deliverance, and Education, or CODE, Legal Aid, which acts as a family resource center for refugees and immigrants. The clinic is housed inside Kalasho Empowerment of Young Scholars, or KEYS, Grace Academy, a 2-year-old charter school in Madison Heights, Michigan, founded and run by Kalasho and her two brothers. Complete with a community garden, therapy services for refugee children dealing with trauma, a full busing system, and a curriculum that includes Mesopotamian studies and Aramaic language, KEYS Grace and CODE provide a one-stop shop for refugee and immigrant families, particularly Chaldeans, to preserve their culture while adapting to life in the United States. As soon as Kalasho got up to speed on the situation, “We all went into panic mode,” she said. Together, she, Naoum, and other members of their community network opened up shop at KEYS Grace that very evening in order to provide support for families and begin shaping the skeleton of what would be their legal response to the detentions. Naoum’s contacts at the larger legal nonprofits, as well as experts Kalasho had called at the ACLU, urgently advised them to start gathering as much information on as many detainees as possible so they could start organizing a class-action lawsuit. In addition to wanting to avoid family separation, Chaldean community members worried that their loved ones—many of whom don’t speak any Arabic—would be kidnapped, tortured, or killed if they were sent back to Iraq. Immigrants with removal orders can only win lasting legal relief from deportation by way of an individual case in immigration court, where there are more than half a million backlogged cases countrywide, and rumors were starting to circulate that planes to Iraq could leave any day. So, in a class-action suit, Kalasho sought to argue that detainees faced immediate physical danger in Iraq in order to compel a district judge to delay deportations until everyone had a chance to argue their case in immigration court. By the time Naoum and Kalasho got to KEYS Grace, families had started gathering at the ICE field office in downtown Detroit to protest. Some recorded Facebook Live videos, one of which captured the moment people realized that agents were loading their loved ones onto buses headed for detention facilities. In it, a man strained his voice yelling frustrated curses at ICE and we-love-yous to the detainees while two women wailed, asking, “Where’s Maher?” between gasps. Amid the chaos, Kalasho’s brother and Naoum’s close friend, Nathan, went down to the field office to be with families and tell them about the legal organizing efforts at the school. Meanwhile, Naoum spread the word about the detentions and the lawsuit via Facebook. Later that night, a handful of volunteers, mostly in their 20s; pro bono lawyers; and dozens of relatives of those who had recently been detained descended upon the K–8 academy. In the CODE Legal Aid office and the school’s adjacent library, volunteers compiled information into a Google spreadsheet until 4 in the morning while others comforted families amid the library’s toys, children’s books, and a treehouse-themed play area with branches painted on the wall by a refugee father. It later turned out that the raids were the result of a quiet deal between the Trump administration and the Iraqi government. Trump had included Iraq on the original list of seven Muslim-majority countries in his January travel ban, to the consternation of national security officials who were counting on Iraq’s support in the ongoing fight against ISIS. But when the Trump administration issued a revised version of the travel ban in March, Iraq was removed from the list. In a conference call to reporters the morning of the revised ban’s release, a senior administration official admitted that the Iraqi government—which for years had been uncooperative in taking back Iraqis the U.S. wanted to deport—agreed “to enhance some of their travel documentation capabilities” and “to the timely return and repatriation of its nationals who are subject to finals orders of removal” from the United States. By the time the raids were finished, Kalasho’s spreadsheet revealed that ICE had detained 114 Iraqis across three counties in Michigan—almost exclusively men, mostly Chaldean. Naoum and Kalasho also later found out that roughly 85 more had been detained around the same time across the country, including a group of Kurds in Tennessee and other Muslims and Christians in New Mexico and Southern California. ICE also had a list of about 1,200 more deportable Iraqis who, possibly until now, were never prioritized for deportation. Adel moved to Michigan with his wife, mother, and siblings as a refugee from a camp in Greece in 1980, after his father and father’s family were murdered during bouts of anti-Assyrian killings in Iraq. His wife gave birth to Robin, their first of five children, in 1981, and in 1987, Adel was arrested on drug transportation charges. According to his lawyer, Milica Filipovic of CODE Legal Aid, Adel’s arrest three decades ago was “nonviolent, no weapons involved,” adding, “He didn’t know what he was delivering.” At the height of Ronald Reagan’s war on drugs, the judge sentenced Adel to 3½ to 20 years in prison. He was released on parole after two. Although Adel came to the United States with refugee status and was a legal permanent resident, he never went through the full naturalization process to become a citizen, for which he was eligible starting in 1985. According to Filipovic, for many non-English-speaking refugees who come to the U.S. with little money or possessions, the naturalization process—which can cost thousands of dollars and involves taking a test in English—seems out of reach. And without naturalization, a felony conviction can render immigrants deportable—even refugees. This is the situation in which most detained Iraqis have found themselves. Although many of the detainees came as refugees, and most came to the United States legally, almost all committed crimes that made them deportable. In a statement, ICE’s Detroit field office director, Rebecca Adducci, described the raids as an effort “to address the very real public safety threat represented by the criminal aliens arrested.” But according to data collected by CODE Legal Aid, half of the 114 Iraqis arrested in Michigan were convicted of drug-related crimes, and roughly 3 in 4 of nonviolent crimes. After his release from prison, Adel established a career working at a used car lot, and then a pizzeria, keeping free of any further trouble with the law. He often spent his free time with his six grandchildren, especially the oldest, Robin’s 16-year-old son, whom he recently taught how to drive. Adel received his first order of removal informing him that he was deportable in 1992. The night before his detention, Adel slept at Robin’s house because he wasn’t feeling well. He has a laundry list of diagnosed health issues, including diabetes, high blood pressure, anxiety, and peripheral artery disease, which leaves him with little feeling in his legs, so he walks with a cane. That Sunday morning, Robin recalls getting a call from her brother who lives with Adel, saying agents in what looked like SWAT gear were looking for their father. So Robin put her 16- and 7-year-old sons in the car and drove Adel to his home, where she found half a dozen agents, wearing uniforms that said police, ready to take him away. Robin peppered the officers with questions for more than an hour before they took Adel, asking if he was going to be deported and trying to show them paperwork proving his compliance with immigration orders. Like many in the Chaldean community who’ve had run-ins with ICE this summer, Robin claims that agents were deceptive and played mind games with her. Eight-year-old Khloe Marogi wears a T-shirt with her detained father’s photo on it at a rally outside the Patrick V. McNamara Federal Building on June 16 in Detroit. At first, agents said that they merely needed to take Adel to update his paperwork and outfit him with an electronic monitoring device and that Robin could pick him up at the field office in two or three hours. One agent, who would only identify himself as Austin, gave Robin what he called his “desk number” to call if she had any trouble, which she immediately typed into her phone. When she called the number after the agents had left with her father, a clerk at a Marriott hotel in downtown Detroit answered, with no knowledge of any ICE agents or any officer named Austin. Austin also told Robin that she shouldn’t worry about Adel, because “even if he were to get deported, we’re going to send him to a five-star hotel called Abu Ghraib,” referencing the now-closed prison in Iraq infamous for physical and sexual torture committed by U.S. troops during the Iraq war. At that, Austin and an officer who only identified himself as Paul laughed. Despite numerous calls and emails, ICE declined to answer any questions for this story. Adel is not allowed to have his cane at the Michigan county jail where he has spent more than two and a half months, so he has trouble walking and circulating blood through the clogged arteries in his legs, and his blood sugar has been sporadic, leaving him feeling constantly ill. His incarceration is scheduled for a 90-day review, and his attorney has petitioned for his release, but Robin has no idea whether that will happen. In the days following the Sunday raids, rumors started to circulate that the Department of Homeland Security had scheduled a plane to transport detainees to Baghdad as soon as that Friday. On Tuesday, a local nonprofit, the Chaldean Community Foundation, held a community meeting to try to figure out what to do. From the time the news of the raids spread through the Chaldean community, responses saw a clear generational divide. Many older, more traditional community members—who had for decades been politically conservative and took Donald Trump on his word that he would protect Middle Eastern Christians—felt more of a betrayal than their younger counterparts. The “old guard leadership,” as Naoum describes it, wanted to fall back on a strategy of political pressure, even though Michigan Republicans were mostly silent on the issue, and attempts by Democratic Congressman Sander Levin and Chaldean lobbyists in Washington to engage the Trump administration fell on deaf ears. On the other hand, some younger community leaders, led by Kalasho and her legal partner, Nora Youkhana, saw the situation as much too urgent to rely on politics. Persuading the rest of the community to put their trust in the ACLU wasn’t easy, as many viewed it as a champion of liberal causes. But by the end of the meeting, Kalasho and Youkhana had convinced enough people that the class-action lawsuit was the best first step toward keeping their loved ones out of danger. ACLU and CODE lawyers quickly drafted a class-action complaint, which they filed before the end of the week, successfully halting the deportation of the detainees from Michigan. And over the next month, they successfully expanded the suit to include all 1,400 Iraqis prioritized for deportation. They also won a temporary restraining order, and eventually a preliminary injunction that will allow all detainees to argue their cases in immigration court. Now CODE has taken up the cause of ensuring that all Iraqi detainees from Michigan have quality legal representation for their individual immigration cases, which has proved difficult considering that ICE has dispersed them among county jails and private detention facilities not only in Michigan, but also in Ohio, Louisiana, and Arizona. Like most of the Iraqis detained that Sunday, Adel’s criminal conviction makes him ineligible to apply for standard asylum-based protection against deportation, according to Filipovic, his attorney. Instead, his only hope for relief has to be based on other legal grounds. Adel has been down this road before. Between 1992 and 2012, he filed four different motions in immigration court seeking protection for if he ever became an ICE priority for deportation, all of which were eventually denied. Most recently, he appealed based on an international treaty known as the Convention Against Torture, which grants special protections to immigrants who can prove under certain criteria that “it is more likely than not” that they’ll face torture if they’re deported. 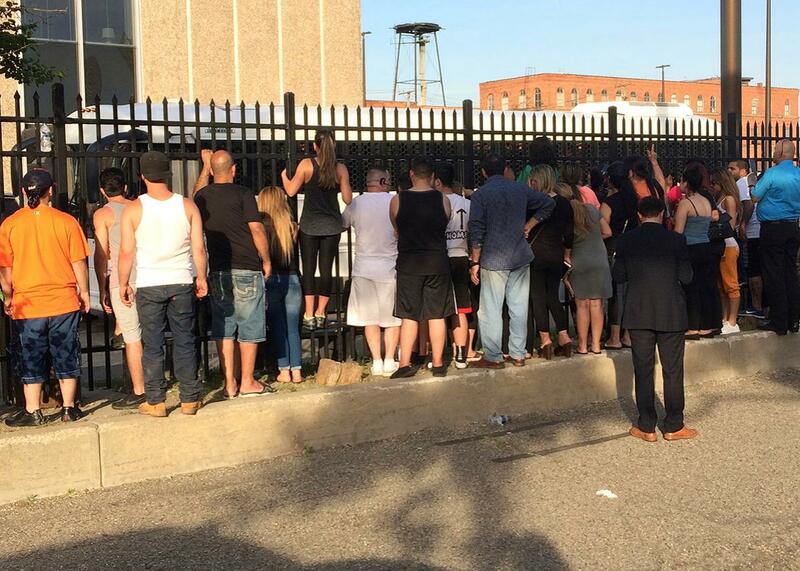 Friends and family view a bus outside the U.S. Detention and Deportation Center in Detroit on June 11. “While the court is concerned that if respondent, in fact, returns to Iraq, he will be in danger,” the judge announced in his October 2012 oral decision, “he will not be in danger from the Iraqi government or with the acquiescence of the Iraqi government.” Even though the judge conceded that Adel would be in peril, he couldn’t stop Adel’s deportation if ICE came after him. This double burden of proving both the likelihood of torture and the government’s acquiescence to existing torture is the legal struggle for most of the detainees CODE Legal Aid is trying to help, according to Filipovic. With cases like Adel’s that have already been denied based on the Convention Against Torture, lawyers are filing motions to reopen based on new evidence of government acquiescence and changes in “country conditions.” And with the preliminary injunction in place, Filipovic, Kalasho, and their team are trying to compile stock research and arguments for all of the individual lawyers to use in their respective immigration court cases. The most internationally recognizable threat to Christians in Iraq is ISIS, which vows to eradicate religious minorities, specifically Christians and Aramaic speakers in areas under its control. But with that area shrinking after ISIS’s recent battlefield defeats, detained Chaldeans plan to argue that they still face an abundance of threats in Iraq—threats the Iraqi government is not only powerless to stop but that it willfully ignores. It’s only if lawyers are able to satisfactorily prove this fearful form of government acquiescence that they will have any chance of saving their clients from deportation. But with immigration courts’ extreme backlog of cases, no one knows when they might get that chance. And with almost all of the Iraqis from Michigan still incarcerated, the stress of the passing weeks is taking its toll on family members like Robin, her mother, and her kids. “We’re not happy-go-lucky people anymore,” Robin said. While Kalasho and her team at CODE Legal Aid have been thinking about legal strategy since the raids, Wisam Naoum, the finance lawyer, has been reflecting on the long-term implications they will have on his community. Aside from families being torn apart and middle-aged and old men facing what they perceive to be death sentences, Naoum recognizes that Chaldeans in Michigan have been thrust into uncertainty about their deeply held social and political loyalties. To Naoum, Sunday, June 11, transformed politics for his community. “This is not partisan. This is a family issue. This is a life or death issue,” he said.